الخيار الأفضل للحصول على المتعة والاسترخاء، شقق مانترا 2 بوند ستريت الفندقية يقع في منطقة رائجة من أفضل مناطق المدينة. يمكن من هنا للضيوف الاستمتاع بسهولة الوصول إلى كل ما تقدمه هذه المدينة النابضة بالحياة. يقع هذا الفندق الحديث على مسافة قريبة من المعالم السياحية الشهيرة. كما يقدم شقق مانترا 2 بوند ستريت الفندقية الكثير من الخدمات لإغناء رحلتك في المدينة. يمكن لضيوف الفندق الاستمتاع بالميزات التالية على أرض الفندق: خدمة الغرف على مدار الساعة, مكتب الاستقبال على مدار الساعة, مرافق مخصصة لذوي الاحتياجات الخاصة, تسجيل وصول/خروج سريع, تخزين الأمتعة. لقد جهزت هذه الإقامة الفندقية بعناية فائقة لتوفر مستوى عالي من الراحة. في بعض الغرف يجد النزيل تلفزيون بشاشة مسطحة, قهوة فورية مجانية, شاي مجاني, غرفة معيشة منفصلة, اتصال لاسلكي بالإنترنت. يقدم الفندق العديد من الفرص للاستجمام كمثل حوض استحمام ساخن, مركز للياقة البدنية, مسار جولف - ضمن 3 كم, حمام سباحة خارجي, تدليك. يحظى فندق شقق مانترا 2 بوند ستريت الفندقية بموقع ممتاز وخدمات يصعب منافستها. يتوفر موقف للسيارات في الموقع مقابل 60 دولار أسترالي في الليلة الواحدة لكل سيارة في أيام الأسبوع مقابل 40 دولار أسترالي في الليلة الواحدة لكل سيارة في عطلات نهاية الأسبوع. It was such a shame that the first night was so noisy with road works and no air conditioning working. We then moved room. We had paid for breakfast but it was packed away promptly with no exceptions so we did not bother again we had breakfast out as what we did manage was very cold! The manager was lovely and gave us a voucher, however the hotel needs to be more flexible when guests can’t sleep due to the road work noise all around the hotel. I really understand that the hotel must want the road works finished as much as anyone. Very disappointed but as staff did not know how to process the voucher we still await the Voucher cost! Sad really! This hotel is perfectly situated within 5 mins walk from the opera house and the rocks and just over the road from the train station. Our room was perfect with full kitchen and seperate lounge area. The only negative was the breakfast which was quite basic and not up to other hotels of a similar standard. We will definitely be back. Excellent location walks away from city centre, staff were all helpful and friendly. The apartment with 2 bedrooms were nice, spacious and complete with everything we need like washer, kitchen among others so we can prepare meals, wash used bottles of our baby. Staff were all helpful and kind, helped us from tour bookings and cancellations. Rooms were a bit small, but bed was soft and comfy. The living space is spacious and has a nice view of the neighborhood outside. Complimentary breakfast and in room dining were all delicious but only few choices. Has a gym, heated pool and hot tub on 18th floor which is nice even if weather is cool. Excellent stay, only issue we had was the advertised free wifi but when logging in, not available and ask for payment, and construction outside which isnt their fault but gets noisy in the morning. All in all, best value for money and very nice stay for a big group of family with children for a spacious apartment rooms, the location is perfect. Great location, minutes away from train station and supermarkets. Rocks, circular quay short stroll away as is Barangaroo through Warnyard station. Darling harbour 10 minute walk as is museum and botanical gardens. Spacious room (stayed in an executive studio). Staff polite, clean amenities. Nice touch with having two tvs so can either watch in bed or in the living room. Not so great was the lighting in our room which made it difficult getting ready or finding items in our bag. Natural light was also lacking as our views was the building next door. Pool views nice, can see the bridge slighlty and can watch the cruise ships take off at 4pm daily. There is roadworks on the main street for the tram system, so not much happening on the street. The met centre (adjacent to Mantra) is handy however only open on weekdays, so if you want to get any groceries etc make sure to do so during the week. Will definitely stay again should i visit Sydney. My room at Mantra 2 Bond Street had a good layout. 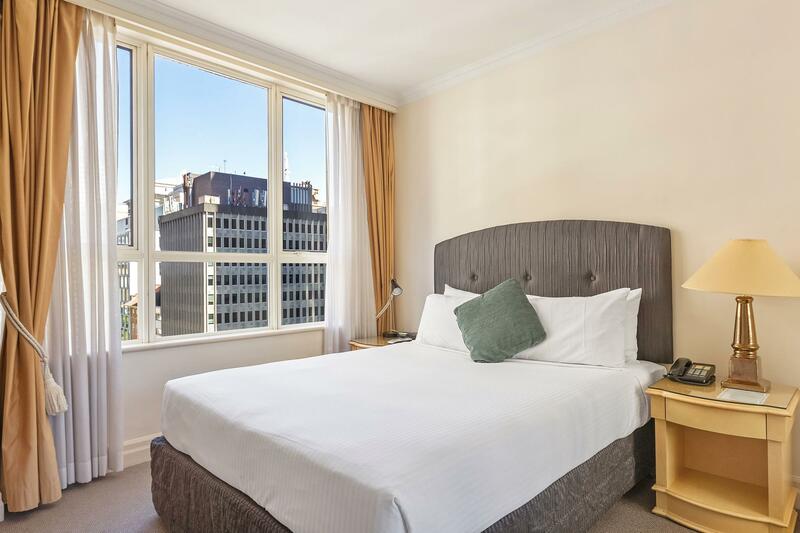 The room was clean and comfortable, and the location of the hotel is perfect - right between Wynyard and Circular Quay train stations and with Circular Quay being so close to iconic locations like Sydney Harbour, Sydney Opera House, Sydney Harbour Bridge, and The Rocks. Concierge do not always pick up the phone when called and had some "interesting" interactions with both myself and other customers while at the counter. Also, I'm not sure if the hotel would be quiet or not when the tram works are actually in progress (they weren't in progress while I stayed there!). But overall, a nice place - I would recommend it to others and hope to return there myself one day. We a family of 2 adults and 1 child stayed 4 nights in this hotel. Our overall stay here was very pleasant. Location of the hotel is superb. it's few mins walk to both circular quay and darling harbour. 2 mins walk from Wynyard station and 1 min from supermarket. Room is very spacious and clean. Staffs are very friendly and helpful. Next to the hotel construction work is going on and bit loud also. Our room was in the other side, so we didn't face the noise. You need to check on this while asking for the room. There is no Netflix in the room, I think hotel management should consider this. We recommend this hotel. This is my default hotel in Sydney! ... Getting anywhere is easy with Circular Quay a 5 minute walk away, the train station a 3 minute walk away and cabs and ubers a plenty. Being boxed in a hotel is never fun, but the Mantra format allows a semi-normal 'on the road' existence. I'd highly recommend you consider the Mantra next time you are in Sydney. I travelled with my husband and our two adult children and daughter in law. 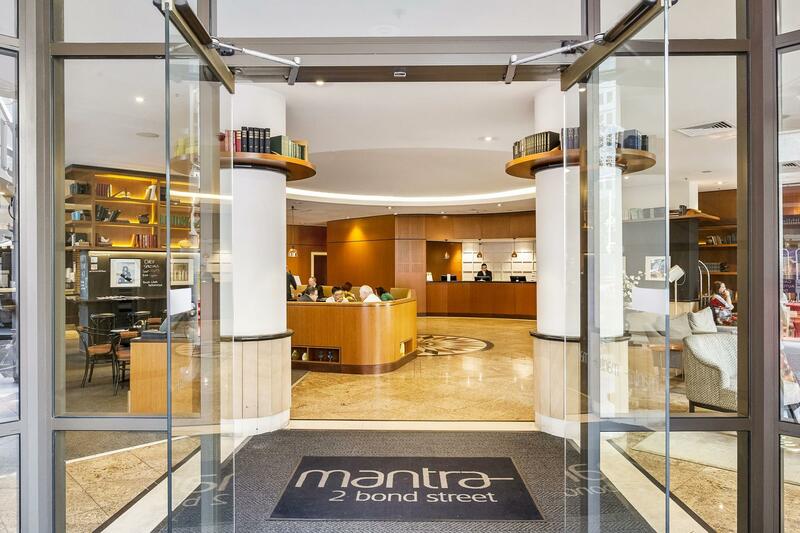 The Mantra 2 Bond Street was a great hotel for our pre and post accommodation on our first-ever cruise. We spent a night at the hotel before our cruise departed from Sydney Harbour and a few nights there after our cruise. It is conveniently located within easy working distance to Circular Quay and The Rocks, and lots of great restaurants. We used the gym and the small swimming pool during our stay and both were adequate. The rooms were comfortable, clean and nicely decorated. The front reception staff were friendly and helpful. Our only complaint would be the strange opening hours of the cafe/restaurant in the hotel lobby. I wasn't at all impressed with this, or the poor service at the cafe. My 2-day stay at Mantra 2 Bond Strret has been remarkable. Though my studio room is supposed to be the smallest of all sizes in this hotel, I find it really spacious and comfortable. Everyone at the front desk is approachable and helpful, esp Yvonne (if I remember her name correctly who can speak Mandarin). I will definitely recommend it to anyone, and will check out other Mantra properties too. Stayed here for 4 nights and enjoyed our stay. Were upgraded on arrival to the newly updated studio suite, which we were thrilled with. Excellent amount of space. Location excellent, short walk to lots of local attractions - Wynyard Walk, Circular Quay, Darling Habour and Pitt Street Mall. Lots of road works going on but did not disturb our stay. Added on the buffet breakfast but we were very disappointed with it, we didn't feel that it was value for money. One morning, they had no bread left and very little choice. Staff in the restaurant seemed very overworked and on the one night we ate in the restaurant, we ordered a number of things only to be told that they didn't have what was on offer. We would definitely stay there again for location only. Roomy stidio a bit more like a one bedroom as the bedroom is on a higher level than the living/dining/ kitchen and almost completely enclosed. No street noise even though we faced onto George Street. Good location opposite Wynyard station, short walk to Circular Quay and Barangaroo. Good rooftop pool. Excellent friendly and helpful reception staff. Mantra is strategically loated in Central Business District of Melbourne. A short distance of walk to most attractions in the city. We were greated by their great staff who were always smiling while serving us. Their staff were well trained to ensure customer satissfaction. Going into the room was a delightful experience. My family fell in love with the apartment as it was so well maintained, much like a hotel room setting. Cleanliness was superb. My wife, who was super sensitive to dust, gave a thumbs up to the place. My children love the place as it had two TVs, one in living room, the other in a bedroom. Well, that room was supposed to be ours, but they claimed it as soon as they saw the TV. The apartment was well equipped with all the necessary tools and electronics that allows our family to be like home. Cooking is possible, washing of clothes too. The only drawback is their room rate is quite high, more than double of the standard apartment the market has to offer. Rooms were larger than expected, everything was clean and comfortable. Location was fantastic. Check-in and check-out process was seamless and efficient. I particularly liked that they do daily housekeeping even though it is a serviced apartment.